Esophageal and gastric pH monitoring and endoscopic examination of the esophagus were performed in patients after gastric surgery. The duration time and frequency of gastroesophageal reflux were studied using an ambulatory 24-h pH monitoring system. The subjects consisted of 43 patients with distal gastrectomy, 3 patients with proximal gastrectomy, 19 patients with total gastrectomy, 9 patients with reflux esophagitis without previous gastric surgery, and 53 preoperative patients. Esophageal and gastric pH were measured 5 cm above and 5 cm or 10 cm below the esophagogastric junction (EGJ). The duration, ratio and frequency of acid (pH <4.0) and alkaline (pH >7.4) reflux, acid and alkaline clearance time, and mean and median pH were measured. From the pattern of the esophageal pH curve, patients were divided into four groups: normal, acid reflux, alkaline reflux, and mixed type. In patients who received distal gastrectomy, acid reflux time (pH < 4) was longer than in preoperative patients. The most common reflux patterns were acid reflux and alkaline reflux. There were some tendencies to reflux when in the supine position, and before and after meals. Endoscopic findings of the esophagus were almost normal, but after iodine staining, slightly unstained patchy areas were recognized in patients in these two groups. After total gastrectomy, alkaline reflux time (pH >7.4) and alkaline clearance time were longer than in preoperative patients. 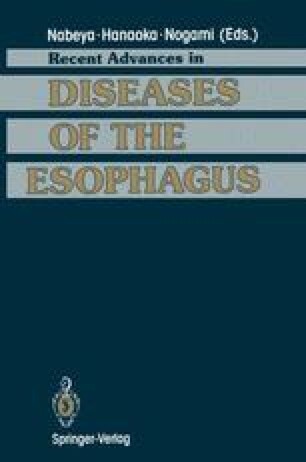 There were a few patients who showed small changes in esophageal pH in spite of esophagitis; the esophagitis in these patients was considered to be due to pancreatic enzymes.